Abstract. The objective of this paper is the development of concretes with low dosage of cement and high alumina content (up to 90%). The properties of refractory concretes are related to the dosage of the cement from the concretes. Therefore, a reduction of the dosage cement from concretes from 20% in the case of the common refractory concretes containing normal dosage of cement to the 10-15% for the case of the low cement concretes (LCC) or to the 3-5% for the case of the ultra low cement concretes (ULCC) with the mixtures use are accompanied by the improvement of the mechanical and structural characteristics like strength, porosity, compactness and refractoriness, too. Abstract. This works presents information about obtaining and enforcing calcium monoaluminate and compressive strength data of samples of materials. Abstract. In this paper we present a synthesis method of calcium phosphate bioceramics such as hydroxiapatite, the mineral component of bones and hard tissue in mammals. Investigations carried out have confirmed obtaining of hydroxyapatite characterized by a high degree of crystallinity, purity, and a good stoichiometry. Abstract. This paper presents the results of structural and compositional investigations on the aluminum alloys "2024" samples products for the aviation industry ALRO Slatina. Abstract. Industrial Ecology is an emerging field that focuses on the twin goals of economic development and environmental quality. The concept requires that an industrial system be viewed not in isolation from its surrounding systems, but in concert with them. It is a systems view in which one seeks to optimize the total materials cycle from virgin material, to finished material, to component, to product, to obsolete product, and to ultimate disposal. Factors to be optimized include resources, energy, and capital. Human beings are only one component in a complex web of ecological interactions: their activities cannot be separated from the functioning of the entire system. Abstract. The work presents research results on achieving adhesion layers and submitting to various parts reconditioning from the composition of parts and determine optimal working parameters giving special operating characteristics of parts. Abstract. This paper presents methods for processing of layers due to analysis results towards hydrodynamic collisions spherical liquid particles to solid media. The process of thermal arc metalizing establish procedures for processing and working parameters of different operations to achieve a uniform coating on dimensions and obtain required mechanical properties. Abstract. The paper presents the main characteristics required antifriction materials used in friction couplings and technological factors contributing to these requirements. It also presents the criteria for choosing the bearing material. Abstract: The study of nanostructured materials is considered an emerging field for the next years. To advance the field of preservation of cultural heritage science and nanostructured materials there is a continuous interdisciplinary collaboration between material science specialists and preservationists. In this work we present a complex study of preparation of nanomaterials based on Ba(OH)2, material used for conservation of a painting from a private collection. Is also presented a comparison between the effects of commercial materials and nanosized synthesized materials. Abstract. Being light Al is a metal with an increasing usage in order to reduce energy consumption and limit the material thrown into landfills. In the metallurgy sector, aspects involving norms have greatly diversified the offer of foundry alloy and aluminium casting produced inside the European Community. EN norms for castings and EN 1676 for alloys are discussed in the paper for aluminium and its alloys together with technical tests that guarantee the correct performance of the castings. Abstract. Comparative FTIR techniques: transmission spectroscopy in KBr and diffuse reflectance spectroscopy (DRIFT) in KBr have been applied to unwritten and inked historical papers. Advantages and drawbacks of each technique have been discussed, regarded to the spectra interpretation. In all cases the cellulose remains the major component of the samples, even in inked and damaged papers and only small discrepancies are observed between written and unwritten papers. An important parameter was the reproducibility of the measurements and the small influences have been pointed out. Abstract. Even in the case of well established technological conditions for steel rolled production at some stages of production line could be observed various defects which causes are difficult to be determined. In the case of analyzed plate the surface defects observed we consider to have origin in the steel casting stage due to high casting temperature , low casting speed and slag entrapment on the slab surface, the defects dimensions have been increased during the rolling stage. Abstract. Many of mushrooms species from the forest area of Bucegi Mountains are consumed by the native population without thinking about the heavy metals uptake in the human body. From all the edible species we choose eight mushrooms, part of them considered edible and part with uncertain edibility. Heavy metals concentration in the fruiting body of mushrooms are different from one species to another and shows mean values of 4.41 mg/kg for Ba, 39.36 mg/kg for Zn, 471.49 mg/kg for Sn and 63.66 mg/kg for Cu. The bioconversion factor of heavy metals represent the level of metals concentration in the mushrooms body correlated with the metallic element in the soil on which the fungus growth, and has values under 1 for Ba and Zn, and the highest values in Hygrophorus virgineus species for tin (9.89) and in Cortinarius armillatus for copper (3.71). Abstract. Zeolites are natural volcanic minerals with a number of unique characteristics. Zeolites were formed when volcanic ash was deposited in ancient alkaline lakes. The interaction of the volcanic ash with the salts in the lake water altered the ash into various zeolite materials. Some natural and synthetic zeolites (molecular sieves) are discussed in this paper. They have various properties, like cation exchange, adsorption and molecular sieving (passing of a gas or a liquid through the zeolite), dehydration and rehydration, siliceous composition and resistance to radiation, making them useful in industry. By the encapsulation of various substances in their mesoporous matrix, like porphyrins or metalloporphyrins, new materials are formed, which are very useful, for example, as oxidation catalysts, in domains like wastewater treatment or photodynamic therapy(, ). In this paper we have studied the structure of some natural and synthetic zeolites. The zeolites were analyzed by means of various analytical methods, like X-ray diffraction and FT-IR methods. Abstract. There is a constant concern for obtaining biocompatible alloys with better characteristics in efficient economical conditions. In this paper, we studied several alloys used in dental technics as implants. After alloying with 5% and 10% copper content, several properties of this modified Ni-Ti alloy were investigated. Abstract. Corrosion awareness is linked both intrinsic properties of steel and especially the operations of formal work and structural imperfections caused by the design and operating conditions. Exposure to a temperature in a range of 500 to 8000C, leads to the precipitation of chromium rich carbides at the grain boundaries and the formation of chromium depletion areas adjacent to these carbides. Following the precipitation phenomena, the chemical changes at the grain boundary region were determined by metallographic evaluation. Abstract. The paper shows up the research results on processing and characterization of composite materials with polymeric matrix (silicone rubber). The materials obtained in laboratory contain metallized nettling like reinforcement material and powdery graphite as filling agent. Measurements were conducted to determine the transmision diminishing carried out. Abstract. Fibre reinforced concrete with steel fibres attracted the attention of engineers and researchers during the last five decades. In recent times, self compacting concrete has been accepted as a quality product and are widely used. 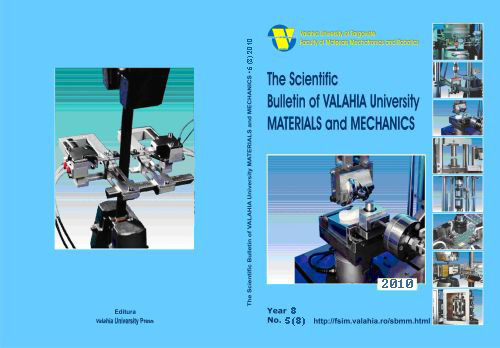 A large number of studies are available with respect to several parameters viz., flexural strength, load deflection behaviour, toughness, ductility, crack control, effects of beam dimensions, concrete filling sequence, flexural toughness parameters etc., of conventional fibre reinforced concrete. The present study aims to study the flexural behaviour of scc beams with steel fibres. An experimental programme has been designed to cast and test three plain scc beams and six scc beams with steel fibres. The experimental variables were the fibre content (0vf¬¬¬¬%, 0.5vf% and 1.0vf %) and the tensile steel ratio (0.99%, 1.77% and 2.51%). The type of fibre configuration used was crimped fibre 30mm in length, an equivalent diameter of 0.5mm and with stirrups of 2l-8 mm dia bars ? 150mm c/c. The scc design mix was proportioned to obtain a compressive strength of 70 mpa and yield strength of steel used was 595 MPa. The experimental constants were the geometry of the beams (2000x125x250)mm as well as the test set up. A series of trials was made to obtain a suitable mix proportioning of SCC based on “Nan Su et al” method. The cracking, deflection and ultimate failure behaviour were experimentally studied. The available theoretical formulae proposed by Suji et al and Samir for FRC beams with conventional vibrated concrete beams were examined for the case of SFRSCC beams with respect to load deflection behaviour, ultimate moment, deflection and width of crack at service loads. A simplified effective moment of inertia function is proposed for the estimation of deflections of SFRSCC beams at all stages of loading. The results are presented and discussed. Abstract. A particular importance will be given to how the principle ideas were managed to achieve an optimal mechatronic product if certain conditions imposed. Schemes in principle on the whole mechatronic product was designed, conducted and completed in detail. The present study attempted to design a robot for the detection of metal objects, being the preferred transportation system with tracks. This system has a high stability and provides a backup speed high enough for such applications. As a result, the mobile robot those covered by this project will adopt this system. Abstract. The paper presents aspects of geometric characterization, micro structural and mechanical physical layer deposited by thermal spraying, control methods and procedures applied in order to achieve coatings with special properties and notable result to the behavior in service. Abstract. This paper presents studies for building a new plant for thermal spraying of various metallic materials used for making or refurbishing items in stock composition. Abstarct. Based on the endeavour of using movement as an efficient treatment, the CALORCRO project has as an aim to promote physical effort as a part of osteoarthritis treatment in Romanian clinics. The project partners worked out both a method to evaluate the gait energetic expenditure and a portable computerized equipment to measure the gait parameters. The newness of both method and equipment consists in the concept of merging the advantages of the two existing systems: pedometer and treadmill with embedded force platforms, in order to evaluate the gait energetic expenditure. The objective of this study was to find the altering degree of some gait kinematic parameters and of the gait energetic expenditure (total expended power) of the subjects suffering from osteoarthritis of the lower limbs compared to healthy subjects, using the CALORCRO device. Abstract. The paper deals with the issue of „eco-labeling of consumer products" through the European legislative framework (Regulation (EC) no. 1980/2000 of the European Parliament and the Council of 17 July 2000 establishing a scheme for EU eco-label) and identifies a micro-guide able to offer consumers the necessary environmental protection issues that includes the product offered for sale. In a market where quality means both improving health and better environmental protection, "eco product" , which minimizes environmental impact and health, ensuring a certain level of quality, can represent the fullfill of the nowaday consumer requirements. European Eco label, which is the only sign of environmental quality, certified by an independent organization is valid throughout Europe and represents a unique opportunity to meet consumer expectations. Abstract. The primary objective of the paper is the integrated approach of best practices in risks management in the process industries. Also, it may be mentioned that the work is a real help in developing management strategies in order to determine a balance of interaction between the four systems (economic, human, environmental and technological) and 'drafts' a reference of integrated management of industrial risks. Abstract. In this work are presented the conjugated influences on the sieving process of two elements:- the friction between the sift material and screen;- locking mesh of sieve with grains unable to cross the screen. The functional characteristics of the vibrating screen are determined, observing the influence of these factors upon the sieving process. Abstract. In this work are presented the conjugated influences on the sieving process of two elements: the friction between the sift material and screen and locking mesh of sieve with grains unable to cross the screen. The functional characteristics of the vibrating screen are determined, observing the influence of these factors upon the sieving process. Abstract. The work discusses both at the national and the international level, the scientific and technologic evolution from precision mechanics engineering to intelligent and information micro-engineering, by presenting engineering evolution matrixes, the structural and the functional generations of High-Tech integrated products, technologies and concepts that make use of advanced research areas and of the development in competitive knowledge. Abstract. The rotary drums are technological equipments used in manufacturing clinker cement materials, cooling cement clinker, cooling burnt pyrites exhausted from roasting furnace lines of sulfuric acid, cooling alumina discharged from calcination ovens, cooling lime exhausted from lime ovens, cooling slag from chemical fertilizer furnaces, etc. Rotary drums are also used in mixing of powder or granular materials, separation and enrichment of ore, coal, etc.., washing ores and other minerals, crystallization and extraction of sugar from sugar beets, etc.., drying various raw materials for cement clinker, clay, marl, furnace slag, coal, grain, etc.. This paper presents some contributions of application using MATHCAD 14? program into design and verification of loose riding rings mounted on support blocks included in the equipment’s bearing group. Abstract. Artificial muscles are likely to be essential components of robotics, and a variety of micro-machinery. The artificial muscles, have the potential to allow future robots to operate with superior muscle elasticity and isometric stress generation, even at extreme temperatures. Some new nanofibers for an artificial muscle is presented in this paper. The artificial muscle is based on a contractile polymer gel which undergoes abrupt volume changes in response to variations in external conditions. The tubes and wetting surfaces of the valves are constructed from teflon which is chemically inert and the fibers are made from Poly-Vinyl Alcohol PVA, alone or with PMMA and as magnetic polymer, with magnetite. Abstract. The paper analyzes in terms of a geometric point of view a kind of bio-mechanism consisting of a legs of a tetra pod animal. Each front leg is a complex structure with three closed contours and each rear leg has only two closed contours. In this paper it was analyzed the geometry of bio-mechanism of a rear leg, both by calculation in Mathcad (based on vector equations) and by modeling and measuring in SolidWorks. At last it was built the soil contact point trajectory. Abstract. This paper analyse through the finite elements method (FEM) a high pressure pump. The analysis of high pressure pump was made for determination of stresses distribution, displacements and deformations. A three-dimensional model of the high pressure pump with a complex geometry was generated based on the designed data. The Finite Elements Analysis was performed using SolidWorks 3D CAD Design and COSMOSWorks software. Results predicted by the finite element method show the method presented is efficient and accurate and in good agreement with the theoretical and experimental values. Results from the current analysis can be used for further studies in designing of the high pressure pump. Abstract. The aim of this paper is to analyse through the finite elements method (FEM) the press ram-linear hydraulic motor piston assembly from horizontal Hydraulic Press – 2 MN. The analysis of ram-piston assembly was made for determination of stresses, displacements, deformations and the factor of safety distribution. A three-dimensional model of the ram-piston assembly with a complex geometry was generated based on the designed data. The Finite Elements Analysis was performed using SolidWorks 3D CAD Design and COSMOSWorks software. The simulation results were evaluated and compared to the experimental data. Results show that the established FEM model provides useful information for the ram-piston assembly optimal design. Abstract. This paper analyze through the finite elements method (FEM) a turbine shaft – main shaft subassembly from a average power hydrodynamic clutch included in a driveline agricultural machinery. The static and dynamic analysis of turbine shaft – main shaft subassembly was made. A three-dimensional model of the turbine shaft – main shaft subassembly with a complex geometry was generated based on the designed data. The Finite Elements Analysis was performed using SolidWorks 3D CAD Design and COSMOSWorks software. Results predicted by the finite element method show the method presented is efficient and accurate and in good agreement with the theoretical and experimental values. Results from the current analysis can be used for further studies in designing of the turbine shaft – main shaft subassembly. Abstract. This paper presents the airflow analysis in a hospital operating room, in conventional (turbulent) vertical airflow. The simulations results allow optimal design of ventilation and air conditioning systems to satisfy the imposed requirements for air quality control and thermal comfort in a hospital operating room. Abstract. This article presents some aspects regarding the reduction of the negative impact generated by economical activities in the field of wood processing by realizing some equipments of pressed sawdust and refers mainly at the fuelling, dosage and homogenization mechanism which is a component part of the pellet grinders. The Fuelling, dosage and homogenization mechanism (picture 1) is installed on the pellet manufacture grinder is composed from a dosage device (position 1) and a fuelling and homogenization device (position 2). The spindle driving of the feeding device is made by a gear motor. The motor speed can be adjust using a speed variable frequency device which is command depending by the required flow of the pellets. The spindle driving of the feeding and mixing device is powered by a constant speed electric motor. Feeding, dosing and mixing mechanism is realised for the CMP type (California Pellet Mill) with a maximum yield of 1000 kg / hour.